Support FMS software. Support USB hid 1.1 specification. Cable length: 1.5m. Compatible with windows 98/98se, NT, XP, Vista. Several hundreds of molders for option, including aircraft, helicopter and drone. The simulator gives you real world flying experiences from your PC. High-performance, high-realism 3D graphics effects. 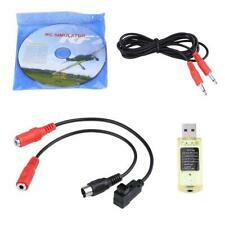 This is a NEW Genuine Real Flight RF8 Flight Simulator Horizon Hobby Edition Software Only RFL1001. RealFlight RF8 Horizon Hobby Edition, Software Only RFL1001 is compatible with RFL1000. Part # RFL1001. 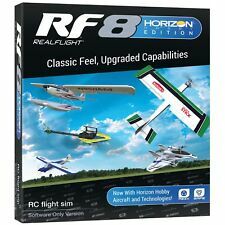 This Horizon Hobby Edition of RealFlight 8 is what everyone has been asking and waiting for! RealFlight® is the #1 RC flight simulator in the world. It’s the best tool new RC pilots can use when learning how to fly. This allows users to get into FPV at a very affordable price point! Couple that with a VR headset and your smartphone to create a high-quality FPV system. WORKS WITH POPULAR DRONES. Item #:RFL1001. This Horizon Edition of RealFlight 8 is what everyone has been asking and waiting for! RealFlight® is the #1 RC flight simulator in the world. It’s the best tool new RC pilots can use when learning how to fly. This is the RealFlight 8 Horizon Hobby Edition R/C Flight Simulator. RealFlight is compatible only with Microsoft Windows. computer you should also be able to run RealFlight. success with running RealFlight products (not RF-X) under a Parallels. The WS1000 makes flying FPV simulators like DRL Simulator and Liftoff FPV Simulator even easier to use with their Spektrum Radio. No more generic PPM trainer port adapters tethering pilots to their computer. It is new, never used. The WS1000 makes flying FPV simulators like DRL Simulator and Liftoff FPV Simulator even easier to use with a Spektrum radio. No more generic PPM trainer port adapters tethering pilots to their computer. Iwata Airbrush Kit. Iwata HP-A Dual Action Airbrush. • Iwata HP-A Dual Action Airbrush. Master Hobby Set. Gravity Feed. Any Detail Artists interested in the smaller needle and nozzle combination. You just need to make sure you are ordering the correct part. Realflight 8 (RF-8). RealFlight® is the #1 RC flight simulator in the world. It’s the best tool new RC pilots can use when learning how to fly. This Horizon Hobby Edition of RealFlight 8 is what everyone has been asking and waiting for! Item #:Ikarus 3071004. Suitable for novices and experts alike. Training Programs such as the new Torque and Hover Trainer for fixed wing model airplanes, the Hover Trainer for helicopters or a special Landing Trainer are outstanding programs to develop your R/C flying to perfection. Unparalleled physics make RealFlight the #1 RC flight simulator on the market. Fly without boundaries in the Sierra Nevada—8 million acres of soaring. Once you're in, the unbounded scope of the flying sites—especially the 8 million acre Sierra Nevada site—will astound you and their detail will draw you in. Learn to maneuver your drone for impressive aerial photos. No batteries or complicated setup are required. If you already own an R/C transmitter, you may also be able to fly your drone simulations with it using the InterLink Elite's built-in interface. Aerobatic models, gliders, scale models, helicopters, indoor models, jets and seaplanes. Fly over 150 models in over 50 sceneries. The new Update 5.7 for aerofly5 is available now. aerofly5 software 2 DVD's. 1 x USB Simulator. 1 x Simulator Software DVDs. Supporting Real Flight G7 / G6 / G5, Reflex XTR, Aero Fly and FMS, Car VRC2.0, etc. 4 slide switches for mode selecting is easy to operate. USB Interface: USB 2.0. Start your flight experience with the Yuneec flight simulator, users can experience real flight characteristics even when sitting in front of the computer. 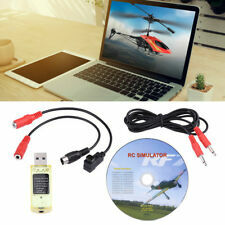 This is a NEW Genuine Yuneec UAV Pilot Simulator USB Stick For PC Software Dongle. Ikarus Aerofly Professional Deluxe Platnium Edition Flight Simulator For Windows. 6 music songs exclusively composed for AeroFly. USB interface with Option for AWC-System (wireless) With this Simulator you will use your own RC transmitter to fly. 4 disc set, great condition. This Horizon Hobby Edition of RealFlight 8 is what everyone has been asking and waiting for! 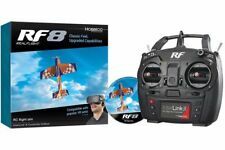 (1) RealFlight® 8 Horizon Hobby® Edition DVD. RealFlight® is the #1 RC flight simulator in the world. It’s the best tool new RC pilots can use when learning how to fly. Horizon Edition Realflight 8Software. RealFlight® is the #1 RC flight simulator in the world. It’s the best tool new RC pilots can use when learning how to fly. This Horizon Hobby Edition of RealFlight 8 is what everyone has been asking and waiting for! It does not include disk 2. Item #5586. RealFlight is the #1 RC flight simulator in the world. It's the best tool new RC pilots can use when learning how to fly. 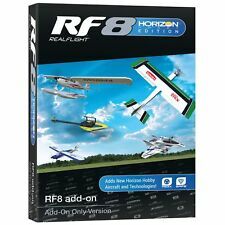 This Horizon Hobby Edition of RealFlight 8 is what everyone has been asking and waiting for! This is a NEW Genuine IKARUS EASYFLY4 FLIGHT SIMULATOR Interface Version. Discover the exciting areas of the 3D sceneries in cockpit or follow mode or practice hovering with one of many included model helicopters. Discover the exciting areas of the 3D sceneries in cockpit or follow mode or practice hovering with one of many included model helicopters. Trainer model, 3D aerobatic model, gas and electric helicopter, glider or jet model, EasyFly 4 features a perfect model for every pilot. Item #:RFL1002. 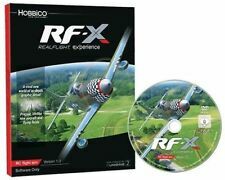 This Add-On disc will only work with RealFlight version 8 (it will not work with previous versions) loaded from a disc or a digital download. RealFlight 8 (Note: Add-on is not compatible with any previous generation of RealFlight software). This is a Great Planes GPMZ5020 Realflight RF-X Wireless Interface Only. Features: Plugs into a computer's USB port and links up user's SLT radio Compatible with all SLT transmitters or virtually transmitter with the AnyLink 2. For use with the Great Planes RealFlight RF-X flight software (not included). Includes: Great Planes RF-X Wireless Interface. Manufacturer: Great Planes. Model Number: GPMZ5020. MSRP: 39.99. Category 1: Other Toys. Category 2: Radio Control Toys. Availability: Ships in 3 to 5 Business Days. Mint Pre-Owned condition in original box with instructions. Flying remote-controlled vehicles can be complex, and many users come to the world of RC planes worried about breaking their new toys. Flying simulators allow you to get a grip on the ins and out of controlling a remote-controlled aircraft through the use of advanced 3D models, free from the risk of damaging anything expensive. There are a number of simulators that allow you to experience operating an RC aircraft before actually bringing your model into the air. Why use an RC flight simulator? A flight simulator makes use of the capabilities of your computer to simulate flight. A PC flight simulator can realistically model the way wind and aerodynamics work and create a realistic approximation of an airplane's flight so that users can experience the intricacies of flight controls free of the hazards that come from flying a real remote-controlled vehicle. Many simulators are designed with the beginner in mind and feature a virtual flight school as a central hub in their interface. That allows even the most inexperienced user to get a grip on complicated factors like wind resistance and equilibrium and become comfortable with the feeling of flying a plane in a controlled environment. But the realistic physics and free flowing sandboxes of flight simulator software means even experienced RC pilots can practice their skills. Whether you're looking to practice daredevil stunts or simple fundamentals, the simulation environment is a sensible alternative to the real thing. What kind of RC vehicles do RC flight simulators emulate? RC aircraft come in a wide variety of shapes and sizes, and the control schemes for these different types of vehicles can vary wildly. As such, many pieces of simulator software offer simulations focused on one or more of the following aircraft. Airplanes: Velocity, wind resistance, and trajectory are important lessons to learn with planes, which can vary from traditional twin wing aircraft to more complicated models like biplanes. Helicopters: Many remote control helicopters are gas powered and maintain flight through the use of four spinning blades. Being able to manipulate the helicopter on both the x-axis and y-axis can have a steep learning curve. Quadcopters: Despite drawing from the same principles as helicopters, they use four rotors for a more nuanced level of control. What type of flight simulators can you choose? Knowing what you want to do with your RC vehicle should be a major factor in the features you're looking for. If you're trying to explore remote-controlled vehicles as a hobby, a simple controller paired with free 3D simulation software might work well, but individuals looking to start a career as a drone pilot might want to look for a more advanced flight simulator program like FlightFear or X-Plane. Controller options can vary from basic keyboard and mouse interfaces to complex controllers that simulate what a drone pilot might use in the field.